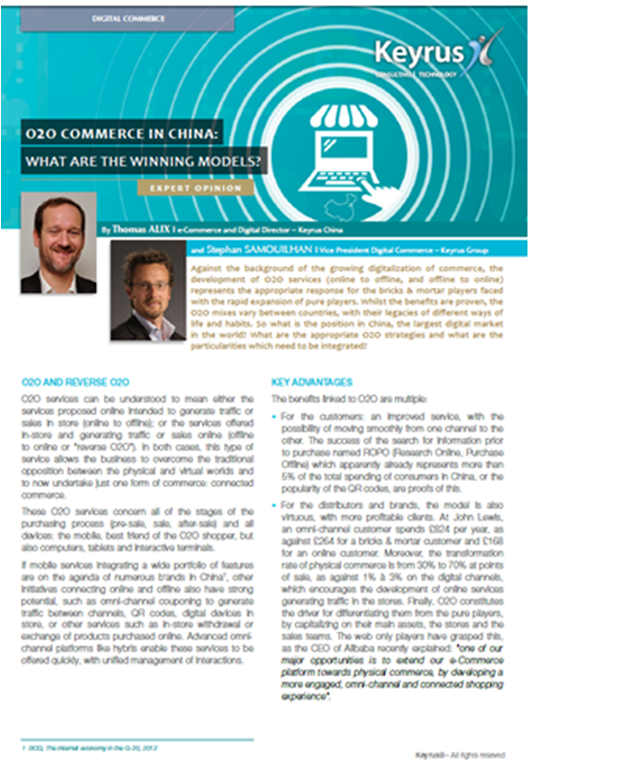 KEYRUS | O2O commerce in China: What are the winning models? O2O commerce in China: What are the winning models? Against the background of the growing digitalization of commerce, the development of O2O services (online to offline, and offline to online) represents the appropriate response for the bricks & mortar players faced with the rapid expansion of pure players. Whilst the benefits are proven, the O2O mixes vary between countries, with their legacies of different ways of life and habits. So what is the position in China, the largest digital market in the world? What are the appropriate O2O strategies and what are the particularities which need to be integrated? O2O services can be understood to mean either the services proposed online intended to generate traffic or sales in store (online to offline); or the services offered in-store and generating traffic or sales online (offline to online or "reverse O2O"). In both cases, this type of service allows the business to overcome the traditional opposition between the physical and virtual worlds and to now undertake just one form of commerce: connected commerce. These O2O services concern all of the stages of the purchasing process (pre-sale, sale, after-sale) and all devices: the mobile, best friend of the O2O shopper, but also computers, tablets and interactive terminals. If mobile services integrating a wide portfolio of features are on the agenda of numerous brands in China1, other initiatives connecting online and offline also have strong potential, such as omni-channel couponing to generate traffic between channels, QR codes, digital devices in store, or other services such as in-store withdrawal or exchange of products purchased online. Advanced omni-channel platforms like hybris enable these services to be offered quickly, with unified management of interactions. For the customers: an improved service, with the possibility of moving smoothly from one channel to the other. The success of the search for information prior to purchase named ROPO (Research Online, Purchase Offline) which apparently already represents more than 5% of the total spending of consumers in China, or the popularity of the QR codes, are proofs of this. For the distributors and brands, the model is also virtuous, with more profitable clients. At John Lewis, an omni-channel customer spends £824 per year, as against £264 for a bricks & mortar customer and £168 for an online customer. Moreover, the transformation rate of physical commerce is from 30% to 70% at points of sale, as against 1% à 3% on the digital channels, which encourages the development of online services generating traffic in the stores. Finally, O2O constitutes the driver for differentiating them from the pure players, by capitalizing on their main assets, the stores and the sales teams. The web only players have grasped this, as the CEO of Alibaba recently explained: "one of our major opportunities is to extend our e-Commerce platform towards physical commerce, by developing a more engaged, omni-channel and connected shopping experience". O2O in China: where are we up to? The most important e-Commerce market in the world, with 8% of the total sales concluded online, China's digital leadership can also be seen in O2O services, through 6 key characteristics. Let us consider each of them. The majority of online connections are now made from a mobile, and more than 30% of e-Commerce transactions in value terms are already undertaken from a mobile (up to nearly 45% on 11/11/2014). Alongside e-Commerce, the development of added-value mobile services (information, payment, reservation, loyalty card, geolocation) is key, because it is precisely the device which enables online and offline to be brought together. We therefore recommend giving priority to mobile development, or, at the very least, attaching as much importance to mobile as to desktop. Paradoxically, the players which are the most advanced as regards O2O are precisely those which do not (yet) have points of sale. For two years, the leaders (Alibaba, Tencent,...) have indeed been investing in online services allowing the physical and virtual worlds to be brought together: grouped purchases to generate traffic instore, sites for making recommendations and giving opinions on physical commerce outlets, the reservation of taxis to go to them, payment by mobile in store. More recently, partnerships have been concluded by the digital leaders with distribution networks to develop hybrid models. Here one discovers a strong particularity of China in the field of O2O: where, in the West, O2O is concentrated mainly on the online-point of sale link, China proposes an extensive definition of O2O, including all the services linked to the purchase process. Our recommendation: proceed as do the leaders by thinking in overall terms, including O2O services along the whole of the purchasing cycle. The separation of uses is far less marked in China, and social commerce is an effective entry route towards online selling and O2O, in contrast with the majority of countries. Today 80% of e-Commerce goes through marketplaces which do not have any strategic advantage in developing O2O services for the brands, since the revenues generated in store escape them. Faced with this difficulty, it is urgent for the brands to master their online distribution platform, for reasons of image and to re-balance revenues between e-Commerce in their own name and e-Commerce via marketplaces. Our recommendation: deploy a dedicated omni-channel platform. If this platform is not mastered, the O2O for a brand will remain limited to a few basic services, thus perpetuating the current functioning in silos (online on the one side, offline on the other). The distribution landscape in China is very fragmented, since the main retailers have a limited market share: the market share of the 20 biggest distributors in China is less than 12%, while this figure reaches 40% in the United States. The players often remain regional and of limited size. The likely consequence: a majority of e-merchants will quickly constitute the majority of the top 10 in retail in China. The traditional retailers absolutely must therefore make the move into O2O services quickly, because it is their main driver for getting back into the race, faced with pure players which are concentrated and therefore powerful. Our recommendation: link up and connect the points of sale with your online activity as much as possible, by increasing the number of marketing links and hybrid services (multichannel couponing, advanced store locators, instore QR codes...). Consumption habits vary depending on the region. While the largest towns (Peking, Shanghai,...) are well equipped with points of sale, the same cannot be said in the smaller towns (Tiers 2 and above). Overall, given the recent entry of China into consumer society and the size of the country, retail is less developed: there is thus 5 times less commercial floor space per person (in m2) in China than in the United States, and 3 times less than in Germany2. It will never be possible to make up this gap: the country is so vast that it will be possible to address certain regions only online. In places where the retailers have a strong presence, in the large towns, it is in their interest to give priority to online to offline approaches, in order to generate traffic and sales in store. These O2O services must be targeted at the pre-sale and the sale stages, but they will not, on the other hand, be very relevant if they are on the segment involving delivery, which is efficient and quick. In the smaller towns, if the distributor is absent or has a limited presence, priority should be given to offline to online models, for example using QR codes in the media, or in the existing points of sale, thus redirecting part of the store traffic towards online. For the delivery component, on the other hand, online to offline is relevant because delivery in these places is often of mediocre quality, for example, being organized via agreements with convenience stores.